Back in January 2015, the Bank of Canada made the surprising move of lowering the key interest rate from 1 per cent to .75 per cent, shocking those who thought a rise was inevitable. But surprise factors like an oil price plunge forced the Bank’s hand, as they made the first adjustment to the key rate since September 2010. The business section of your newspaper has been filled with stories about it ever since, still peppering in reminders of the “inevitability” of a rate increase, and filling us up to the brim with graphs and pie charts about the economy at large. Mortgages are the single biggest piece of debt that most of us will ever have, so if you want to take advantage of low interest rates, this is probably the place to start. If you’re in the market to buy, this is a great time. A recent Bank of Montreal home buyers survey found that more than a fifth of millennials have shortened their time-frame for home buying, thanks to the low rates. People shopping for mortgages might want to consider taking the fixed-rate option. Historically, variable rates have been better for homeowners, but some financial experts think now is a time to lock into a fixed-rate. Ted Rechtshaffen, president at TriDelta Financial, argues that a lot can change over a 5-year period, and the risk of variable rates are not worth the reward of the small premium you get when choosing them. Current home owners can also take advantage by making their mortgage payments as if there was no drop at all. The Canadian Association of Accredited Mortgage Professionals said over a third of Canadians were able to bump up their payments in 2014, with some renewing their loan at a lower interest rate. More money going toward the principal instead of interest means faster repayment and a lot of savings. If your mortgage payments aren’t as high as they used to be, there are other ways to spend the difference. 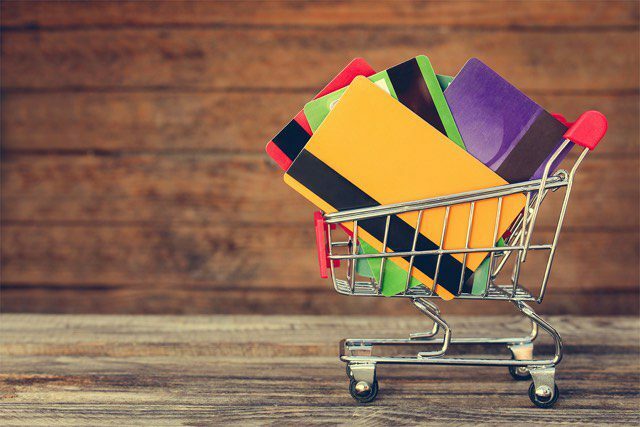 The key interest rate may be low but your credit card APR is still astronomically high. If you are only making minimum payments on your credit card, you are not making very efficient use of your money. If your mortgage payment has dropped by $150 a month, putting some or all of that toward your credit card will dramatically reduce your debt and save time and money. Consolidated Credit’s credit card debt calculator illustrates this idea. 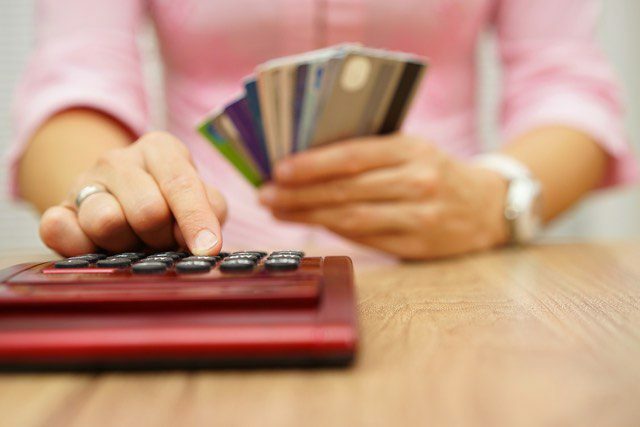 If you’re making the minimum payments on a balance of $3,720 (the average Canadian credit card debt), at 19 per cent APR with a minimum monthly payment calculated at 2 per cent of the balance, it would take nearly 50 years and cost you $13,000 in interest. Add your monthly mortgage savings of $150 to your minimum payments and your debt will melt away. You’ll repay the balance in two years instead of fifty, and you’ll save over $11,000 in interest payments. It’s a no-brainer. Before we get carried away, let’s not forget about the “inevitability” of interest rates rising. If you’re taking advantage of lower rates, make sure your budget can handle the eventual bump in rates. Try stress-testing your finances by pretending the rates have increased, and see whether or not you can still meet your financial obligations. Chances are, any actual increases will be gradual and will allow you the chance to make your own budgetary adjustments. But it is still a wise move to tread carefully and try not to over-extend yourself. Make hay while the sun shines, but keep an umbrella handy. 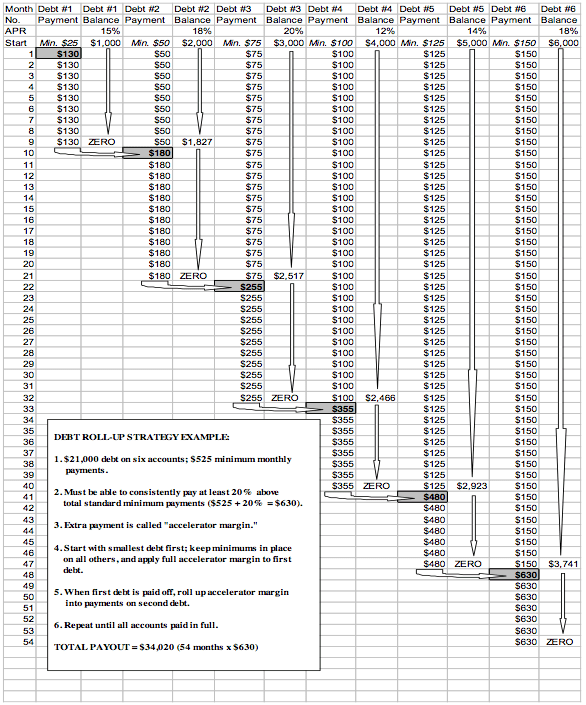 The Debt Roll Up process (often referred to as debt snowball) is simple to understand and implement. This method to pay down credit card debt requires commitment and discipline. The approach is straight forward. You simply pay more than the required minimum payment on one credit card until it is paid off. Once you knock down the first account, you use the same amount of money you were using to pay the first card and apply ALL of it in addition to the minimum you are paying on card two – until it is paid off. You then take the same amount you were once paying to card one and two and combine ALL of that money with the payment you were already making to card three until it is paid off. You repeat these same steps until all credit cards are paid down to zero. In other words, you are rolling up you money to pay off each successive balance, or using additionally money to gain momentum on paying off the next debt until your last remaining debt is being paid off with the largest amount of money, like a debt snowball rolling down hill grows in size. Many people have success with this method. In fact, after the credit cards are paid off, some will go on to apply the money that was being used to pay credit card debt and use it to accelerate the payoff on vehicles and mortgages! 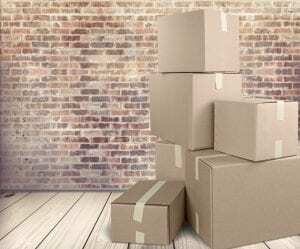 The debt roll up strategy is used by someone with the monthly cash flow that supports an ability to pay roughly 20% more than the required minimum payment on the credit card that receives the first “roll up”, or “debt snowball” treatment. Successful use of this strategy is not just about having the money in your monthly budget to support the debt payoff effort. It can often include making sacrifices. How to pay off credit card debt quickly with debt roll up. The use of a credit card, or any form of debt for that matter, can be looked at as “pulled forward demand”. You are buying something that you either cannot, or choose not to, pay for in full. Delaying purchases that can be put off or eliminated entirely will help you plan around the debt roll up strategy. The key to aggressively paying off credit card debt using money from your available budget is not to create any new debt! The CRN debt relief program is designed to offer debt solutions that involve one on one support, guidance and service. It is rare for someone implementing a debt roll up strategy to need to pay anyone for support. If you are working with a debt roll up strategy, and have a unique situation where CRN membership would be of value, call us and we can talk about it. Otherwise: If your credit card and other debt is a problem, but you have room in your household budget to use the debt roll up method, you may benefit from joining a community that supports this approach. Check out ready for zero and look at some of the fantastic technology tools they have available for free! Debt Roll Up became more popularized by Dave Ramsey and John Cummuta. Ramsey is likely responsible for the term “debt snowball” becoming the most familiar way debt roll up is described. If you are a Dave Ramsey fan, have questions or comments about variations of working through a debt roll up process of your own, or simply want to share your successes with other readers, you are welcome to participate in the comments below. If you are new to the CRN site and would like to get comprehensive information about different options for dealing with problem debt, we recommend starting your review of our free online debt relief program with: Introduction to Debt Relief. What are bank sponsored credit card hardship payment plans? Banks reach out through the phone and with mailers in an effort to get accounts that have fallen behind back on track. Large credit card banks are willing to work directly with you shortly after you miss a payment. Hardship payment programs are a bank’s loss mitigation effort for credit card debts. The larger lenders have well established and effective strategies that are often fair and measured to your ability to pay. The problem is… they only offer them to you when you fall behind. I cover the many issues with missing payments, and hardship repayment plans in general, in more detail below. You will want to be aware of potential drawbacks before agreeing to the plan with your lender. First I want to dig in to how and why banks offer to reduce your monthly payments, and that you do not have to wait for an offer to come to you, but can be more proactive in asking your credit card bank for help. The first step is to talk to your creditors about your situation. You may have already tried talking to your credit card banks about lowering your payment in the past. The hardship you explained to the customer service rep probably did not seem to matter. That is primarily because the person you are speaking with is generally not empowered to make any changes to your payments, even if they wanted to, if your payments on the account are current. Your bank that was unwilling to work out lower and more affordable monthly payments with you when you were current is often willing to work with you if you have fallen behind. If you’ve missed credit card payments, you already know that banks start reaching out to you with phone calls, emails, and letters right away. Banks know that constant “reminders” that you are late with a payment increases their potential to get your credit card back on track with some type of payment. Many of the larger credit card issuers will reach out to you and offer lower monthly payments within days of missing a payment, while some banks won’t offer a lower payment option until you are a few weeks to a month or more late. 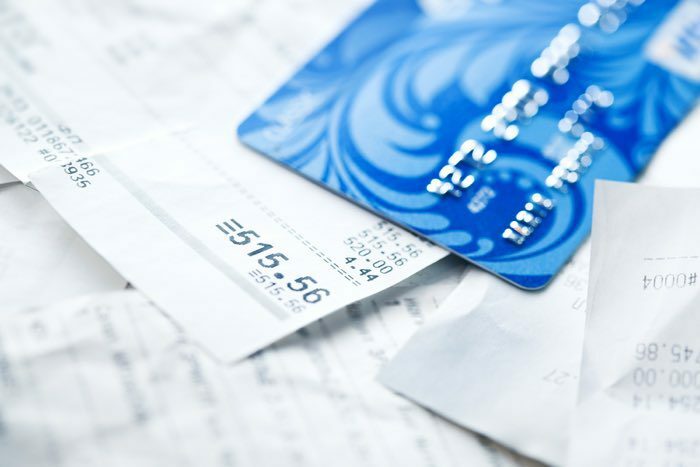 We have previously discussed how lower monthly credit card payments are available through consumer credit counseling services and companies offering debt management plans. More banks began making direct offers to account holders when payments were missed after the economy began dipping into recession. The payment reduction a bank may offer directly to you comes from their willingness to reduce your interest rate temporarily, or over the life of the repayment plan. You do not need to send a hardship letter. Drafting and sending a hardship letter to your credit card bank is typically unnecessary. Hardship letters are something more consistent with what you would include when you are looking at a home mortgage modification, a short sale, or qualifying for some type of benefit or adjustment on your home loan. Qualifying for a hardship program with credit card debt is literally just a matter of a phone call, and qualifying in your credit card banks system for the payment reduction. If you bank representative asks you to send in something in writing that outlines your hardship, it is typically not a problem to send them what you would convey over the phone, but detailed in a letter or email. 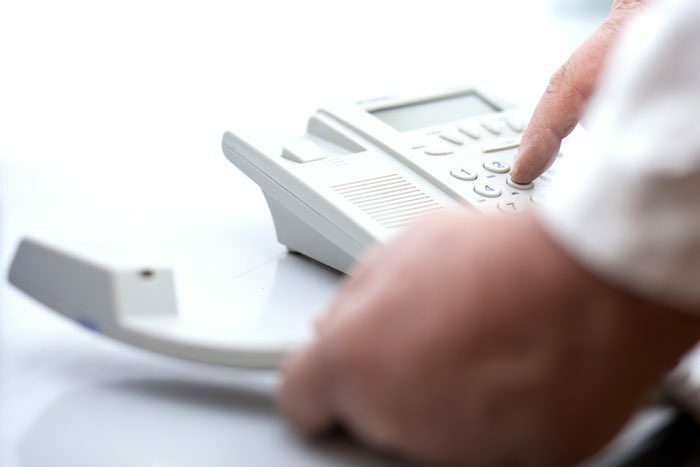 The vast majority of us will be able to answer one of our credit card lenders frequent calls, or place a call ourselves, in order to discuss lower monthly payment options. Hardship repayment plans will be different from one bank to the next. How late your payments are, how much you owe, your household expenses, all will contribute to what type of lower payment the bank will offer you in one of their internal hardship plans. Bank-sponsored lower monthly hardship repayment plans are accomplished by reducing your credit card interest rates. Some hardship payment options have a temporary timeline. The temporary plans will often last as little as 3 months and go as long as 12 months. Your payment is reduced because the creditor is willing to lower your interest rate for several months while on the the temporary hardship plan. Interest rates may be as low as zero percent and typically will not exceed ten percent. Your bank will often waive or eliminate any fees and penalties that were charged to your account when you are repaying through one of their hardship plans, but only after you make several payments on time. Some, but not all banks, will allow the account to stay open when you are on a temporary hardship repayment plan. This would mean you could resume using the card when the temporary plan is over and you successfully made all of the payments. The temporary reduced payment plans are useful to someone who is only experiencing a hardship that is not expected to continue for any significant period of time. Longer term hardship repayment plans offered by credit card lenders did not become popularized until the economy started to take a dive several years ago. Those banks offering long term plans, at the time of this writing, will close your account, freeze your interest rate at between zero and 10%, and amortize your monthly payment using your current balance. Your new lower monthly payment will be the same every month over a 60 month time period (federal regulations prevent these plans from exceeding 5 years). Some banks offered long term plans during the worst of the recession, but now only offer temporary plans. How many creditors you will have to contact in order to achieve the same result. You may not be able to get the same results a counseling agency would get for you. The credit counselor will only have to get your account details and your income and expense information from you once. If you have many credit cards, and some of them do not offer the longer term hardship plans, you are often better off getting the lower monthly payments through a credit counseling service, rather than making all of the efforts on your own. And because talking to a certified counselor to get an exact quote of what your credit card payment will get lowered to is free, and you DO NOT have to be late with payments, I recommend you speak to one at 800-939-8357, ext 1. Approval for reducing your monthly payments is not automatic just because you are late with payments. You can be turned down, and for predictable reasons. Your bank is going to want to discuss your ability to make any lower payments, and this will typically involve answering a series of qualifying questions. The information you will be asked for will focus on your monthly income and household bills. Be ready to answer questions about what you pay for rent or a mortgage, how much you pay for phone and cable (cell phones too), utilities, groceries etc. How you answer these budget questions will impact what plan you qualify for, or if a reduced payment plan will be available at all. If your monthly cash flow shows money is too tight after you pay typical living expenses, you obviously cannot reasonably commit to any plan, no matter how good the terms. Your bank, who you assume wants nothing more than to collect on what you owe, may actually tell you that they don’t want your money! If your income and expense exercise shows you have too much money after your regular bills are paid, the lower payment plan your bank offers may not be as good, or may not be made available to you at all. Mainly due to the fact that you do not appear to them to be in a hardship situation using their preset criteria. There are many situations I see where your bank may not offer you a hardship plan, but would allow your account to be enrolled in a credit counseling plan, which accomplishes the same long term payment reduction. Some banks that offer the 5 year long hardship repayment plans may require that you recommit to the plan every year. 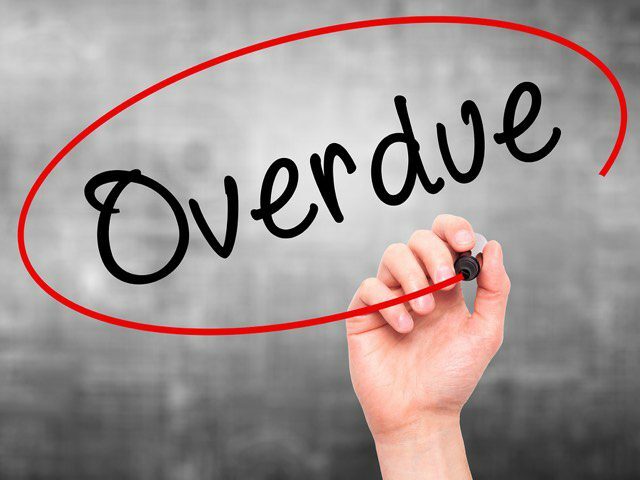 Depending on how many months you have missed payments, your creditor may agree to “re-age” the account after 3 or more timely payments on the plan. This means they will bring your account current in their reporting to the credit bureaus. This takes the sting off of the 30, 60, 90 and longer late pays, that may already be on your credit report, and prevents them from affecting your credit in perpetuity. There are limitations to the re-aging benefit. Once your account is 3 months late, some banks don’t re-age. If your account is not charged off (typically 6 months late), you can still get lower monthly payments from banks offering them. As a general rule, whether you work through a credit counseling service, or work directly with your bank(s) to set up a hardship payment plan, it is best to do so before you reach 90 days of consecutive nonpayment. I already mentioned how these payment reduction plans are generally not available to you until you miss a payment (depending on the credit card lender). That can have credit reporting impacts if you allow an account to go more than 30 days late. But here are some warnings to consider before you try to get set up with a reduced payment, or call in to see if you qualify. If you make calls to your bank asking about a payment reduction plan, you’re basically telegraphing to them that you are at risk of missing payments. This may result in the bank lowering your credit limit to what you currently owe, or possibly closing the account. If you still have the means to make your normal monthly payments, calling your creditors to discuss your hardship, or any available lower monthly payment options, is not recommended. The hardship repayment strategy should be reserved for the banks and accounts you are already late with, or know that you soon will be. Some of the smaller banks, credit unions, department store cards, and fuel station credit cards, do not offer hardship payment plans to you directly, but do generally offer the lower monthly payments to you if you go through a credit counseling service. In nearly all instances of banks offering credit card hardship payment plans, whether temporary or long-term, they will want the payments to be pulled through electronic access to your bank account on the same day of the month. So, you must be prepared for those payments being pulled (always leave yourself a balance cushion). If the money is not in the account, causing the payment to fail, you may not get another chance at it, and your payments can revert to the higher interest rates. The biggest concern you should have with starting a hardship repayment plan directly with your creditors is the same drawback to getting lower monthly payments with a credit counseling service – the inflexibility. You must make your monthly payment on time, all the time. If you miss a monthly payment on either of these plans, it results in losing the lower payment benefits, and the lower interest rates. The worst part of falling off of a payment plan will be the lost time and money that gets wasted on a strategy that did not relieve your debt problem. I mentioned that any credit card payment plan you agree to will require you to never be late in order to keep the benefits. It is rare to get your bank to forgive any payment failure and keep your payment reduced. But you can often be more flexible with how you use hardship payment programs with your different credit cards. You can be deliberate with your planning from the outset. A good example of this would be enrolling one or more of your higher balance, or higher interest cards, into a hardship plan while maintaining normal payments to others. Due to passage of the CARD Act, creditors can no longer arbitrarily raise your interest rates based on your payment performance with other creditors. They can only raise your rates if you miss payments on your account with them directly (and after 60 days). But be careful with this, as it would not prevent them from lowering credit limits if, during a periodic review, they see that you are behind in payments to other creditors. Creditors often will not set you up in lower payment plans, or offer any form of payment concession, more than once over a set period, or perhaps only once… ever (though you can often negotiate and settle the debt for less after dropping the hardship payments). A temporary credit card hardship plan today may keep the bill collector at bay – but be sure you have a real plan for your debt and not just some one time band-aid. You may have multiple credit card accounts that you are trying to juggle. You can use a creative and flexible approach to managing your bills through selectively enrolling only some accounts in creditor-sponsored hardship plans. Alternatively, combining lower monthly repayment plans with budgeting and money-saving strategies can also work as a debt solution for the right person. There are also instances where I have worked with people to settle some credit card debts, and then do a hardship payment plan on others accounts. 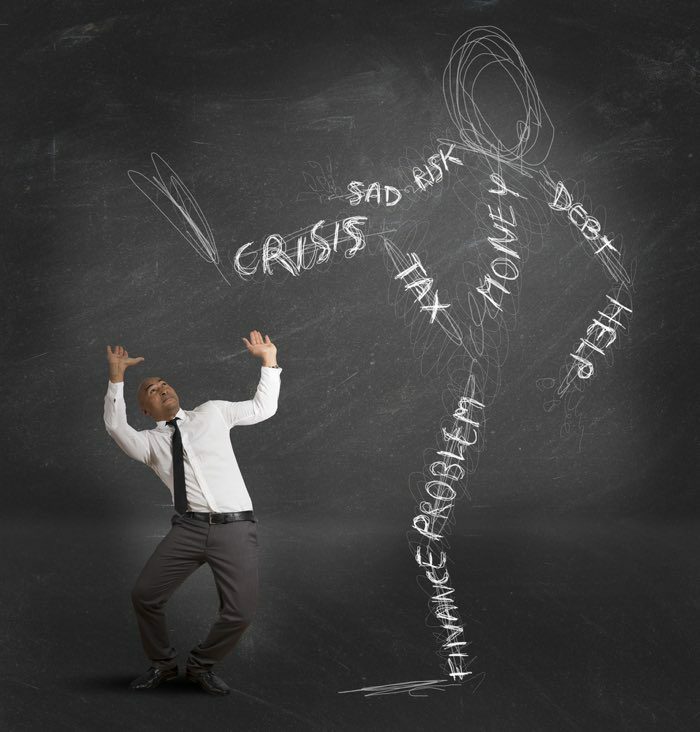 What kind of credit or debt relief can you afford? Is your current monthly cash flow either now, or in the near future, not enough to meet your monthly debt obligations while allowing for a set amount of savings taken from income each month? If not, you are currently, or soon could be, in a financial bind. What can you do about it? What is the right debt solution? Providing an answer to these two critical questions often requires a detailed individual analysis that is best delivered one on one. That said, here is a list of general questions and criteria to help you determine which path is most suited to your specific set of circumstances when starting on your journey to healthier finances. Can you consistently pay 20% or more over your minimum payment toward your unsecured debt each and every month? If yes, a debt roll up program (sometimes referred to as debt snowball) can work for you. Can I Consolidate My Credit Credit Card and Other Unsecured Debt Into One Debt Consolidation Loan? 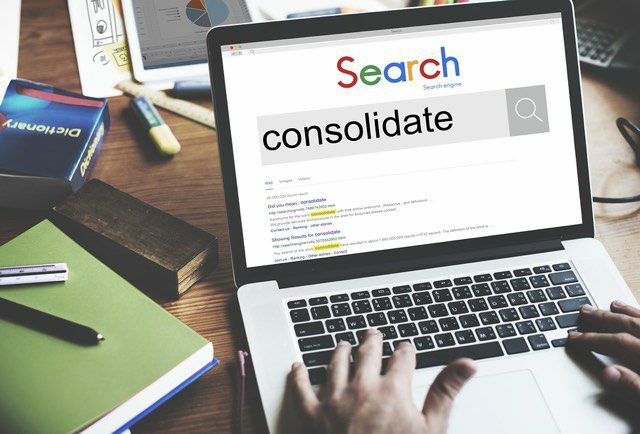 The goal with debt consolidation is to take multiple higher interest credit card debts and consolidate them into one loan, with one payment, at a lower interest rate. In today’s tightened credit markets, it is increasingly difficult to get approved for a debt consolidation loan with major banks, especially when already carrying too much debt. If you have a credit score of 660 or higher, you may be able to qualify for a peer to peer loan through LendingClub. I will have more on LendingClub in an upcoming post. 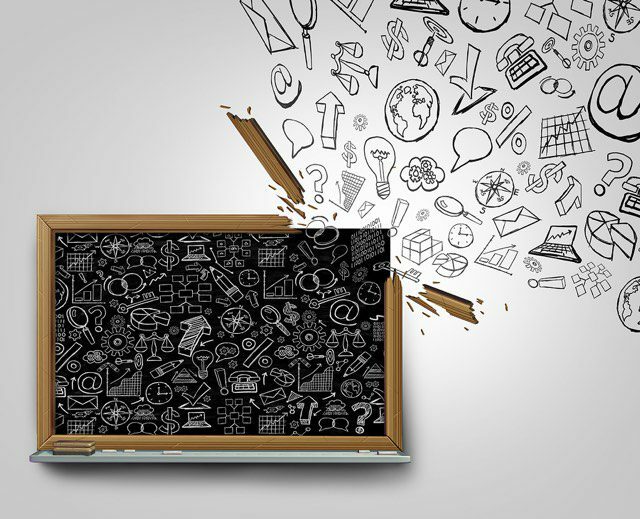 Will a credit counseling service’s debt management plan work for you? Can you consistently (without any skepticism) pay roughly 2 to 2.5% of your current credit card balances monthly? Can you commit to doing so for the next 5 years? If yes, look into credit counseling where you can lower your monthly payments through available interest rate reduction programs. Here is a simple tool you can use to calculate what your debt payments are just making the minimum payments compared to the average lower payment with credit counseling. Compare the monthly payments and time it will take to be credit card debt free in the red, yellow, and green sections. Will a Debt Settlement Plan Work For Me? Can you identify sources of funds in order to raise approximately 50% of your current balances over the course of a set period of time? If so, debt settlement can work for you. If not, look into bankruptcy. Should I File Bankruptcy in order to shed debts I cannot afford to keep current? Can you qualify for chapter 7 given your states median income means test? If so, will chapter 7 force the sale of your home or other items of value that could have been sold and assisted in funding settlements in the prescribed debt settlement program time frame thereby allowing you to stave off filing for bankruptcy? Consult with an experienced local bankruptcy attorney and find out. Bankruptcy is too often incorrectly considered a consumers last resort when dealing with problem debt. For many, it will prove to be the most obvious solution and option of first resort. Chapter 7 bankruptcy provides the most immediate relief and the quickest path to a financial fresh start. You need to learn how each of these options fits in with your current financial ability and you’re future goals. Choosing the correct path at the beginning of this journey could mean the difference in reaching your destination, or remaining lost in a jungle of debt. Anyone looking for expert feedback about the direction you can take to resolve debt, with the income and expenses you have to work with, can post in the comments below for feedback. You can also call me for a consult at 800-939-8357, and press option 2. Debt Settlement Company – You Can’t Compete With Liars! A friend and I were having a conversation several years ago about his and my companies approach to working with consumers who are struggling financially. The context of the discussion was centered on how we both approach consulting with potential customers. His company, like CRN, is direct and honest in their assessment of consumer’s options, nearly to a fault. At the time, the CRN debt settlement company business model was still relatively new and competitors would win over business by saying anything they needed to in order to close the sale (many still do). While expressing my frustration, my friend said something that I have not forgotten since. You Can’t Compete With Liars. Steve puts out regular content about the debt relief industry. The theme of his coverage can be best described as “Debt Industry – The Good, The Bad, and the Ugly”. When it comes to competing with liars though, his recent piece outshines anything I have heard or read to date – on tape even! He published an extremely well-put-together investigative piece about false and misleading claims and the straight up willingness to lie, by those offering debt settlement services for a large attorney law firm and some of its affiliate marketing partners. He did not even have to try very hard. He batted 1000%. He only made 3 calls during peak hours to the sales reps and all 3 were willing to lie, deceive, and connive to make a sale. HAT TRICK! The fact that these sales reps are working for and/or fronting themselves in direct relation to a law firm provides even more of a “greasy” feel to the whole thing. The practice of “say anything” to close a deal has been so wide spread, and the abuse now so well documented, that the FTC has published new rules to reign in the crazy profiteering. The new laws will be aggressively monitored for compliance as they become effective in the next 8-12 weeks. The attorney-modeled debt settlement companies are not exempted in the form many are known for today. The industry gnashed their teeth and wailed about how the abuse and misrepresentations were the result of a few bad apples. They have only come off as disingenuous. What we have seen to date, and will continue to see for a while longer, may prove that this kind of “scammery” was more the norm for selling debt settlement. One thing for certain, the company(s) exposed in Steve’s piece likely have some “‘splainin to do”. 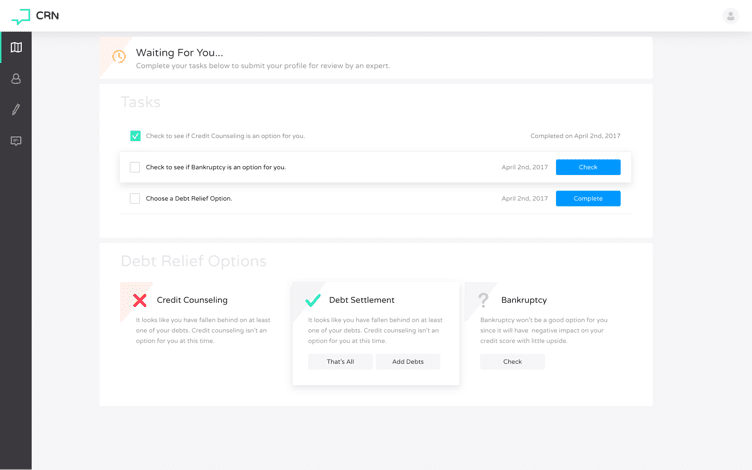 If you are interested in getting a grip on what debt settlement is, how it workd, and what that may mean to you, there are many resources available here on the CRN site. If you have a debt settlement question, we invite you to submit it and get straight answers from a debt pro.